When it’s time to do the grocery I always (ideally) like to fly solo. When the whole brood comes along, things no doubt get crazy with all sorts of stuff mysteriously appearing in the cart by checkout time. And don’t think this is solely from the little ones. C always sneaks in some contraband – Vienna sausage, Spam, and his beloved instant noodles. As far as little C goes, the aisles are both a treasure trove and a minefield…sugary snacks lurking in every corner and, gasp, again, the instant noodles. As for the littlest one, although he has yet to learn how to demand for treats, he does his own damage trying to run amok and tear everything from the shelves (I exaggerate…but not by much). Now, don’t get me wrong, I am not some sort of health food fundamentalist. Far from it! I am pretty relaxed when it comes to food (if you haven’t noticed by now), just as I am about life. I like to generally eat mostly whole, “real” food, generally avoid junk food and artificial ingredients, and generally endeavor to lean towards homemade versus processed. I say generally very, well, generally. Do I eat junk and processed food? Yes. Do my kids? Yes. Sometimes. And I don’t stress about it. I try for the majority of our food to be wholesome, so I don’t have to crack the whip when my child asks for a Yan-Yan as a treat while grocery shopping (raise your hand if you know what Yan-Yan is!). And I certainly will not deny my husband his “emergency stash”. Solo grocery trips are definitely more efficient, and more frugal, but also very much a luxury. With our busy schedules often keeping us away from the little ones, we can’t resist the round pleading eyes when they clamor to come along. So we pile ourselves into the car and off we go. Of course baby, of course. – In a medium bowl whisk together the flour, sugars, cocoa, baking soda, and salt until thoroughly combined. – In a separate mixing bowl whisk together the milk, buttermilk, eggs, oil, and vanilla. – Make a well in the center of the dry ingredients and pour in the wet ingredient mixture. Whisk together just to blend – do not overmix. The batter will be lumpy and that’s fine. – Heat a skillet over medium high heat and, when hot, add a pat of butter. When the butter is melted and bubbling, add a ladleful of batter. Generously sprinkle on some chocolate chips. Allow to cook until bubbles form on the surface, about one minute, then flip and cook the other side. Repeat with the rest of the batter. The original recipe had a chocolate sauce and was served with bananas and strawberries, which sounds absolutely wonderful, but I was low on fruit and did not have the energy to make a chocolate sauce so I opted to add chocolate chips to the pancakes themselves. Suffice to say my chocolate gremlin, little C, loved them! She had them for breakfast, and every snack and dessert thereafter. She was reluctant to share but I finally convinced her. Of course, I filched some while she was in school, like the good mom that I am. We had them with maple syrup but I imagine they would be fantastic with whipped cream, or the aforementioned chocolate sauce (or peanut butter!!!). What I like to do to save time, and make my mornings less frenetic, is to mix all the dry ingredients at night (preferably when the little ones are asleep). It’s quite therapeutic and lulling to measure out and mix ingredients, especially dry ingredients that offer no resistance. This way, the next morning, it is simply a matter of getting the wet ingredients mixed in and the pancakes cooked. Mixing the wet ingredients together is an easy enough task to enlist the help of your child – it’s a great way to get them helping out and interested in cooking. You can also make the dry ingredient mix during the weekend and have a homemade “pancake mix” for emergency pancakes during the week (and we all know that there is always a time during the work-week when the powers of emergency pancakes will need to be called upon correct?). So, in the tug-of-war between being the mom that does everything correct and the mom that does everything cool, I choose…not to choose. I relax and go with my gut. I try to make good choices. And I try to make them happy. 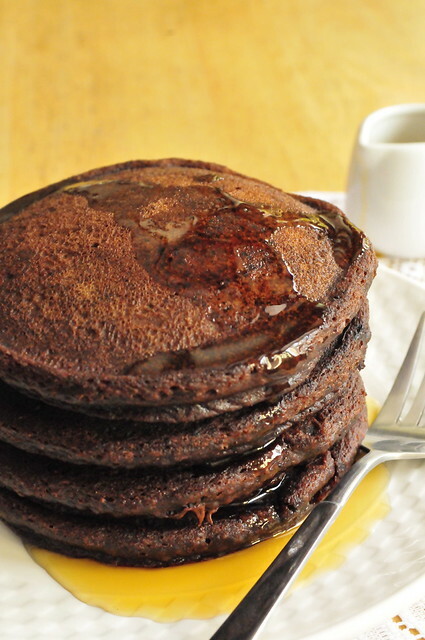 And along the way there will be wild grocery adventures…and chocolate pancakes. Chocolate and pancakes! Each of them has enough attractiveness for many people. Together, they are much more tempting. I love chocolare and this chocolates pances look so so good.